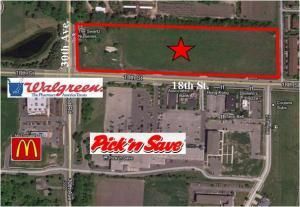 1771 30th Ave, Somers, WI Lots and Land Property Listing | My-Dwelling, Inc.
9.6 Acres +/- of Prime Development Land. Adjacent to many Retails establishments. Additional land may be available. Phase 1&2 Inspections are done. Seller may be willing to divide into smaller parcels. $13,253 would be your approximate monthly principal and interest payment. This payment is based on a 30-year loan at a fixed rate of 4.12 % with a down payment of $299,999. Actual lender interest rates and loan programs may vary. Courtesy of: Michael DeLuca Realty, Inc.